Although death is inevitable, rarely do we spend time preparing for it. According to the teachings of the Buddha, it is possible to die fearlessly, to approach death as a powerful positive spiritual experience, and to eventually overcome death completely. In the Discovering Buddhism "Death and Rebirth" module, we will explore how to face death without fear by learning what to anticipate during the process of death and rebirth. We will also explore the impact that awareness of death and rebirth can have on the way in which we live our daily lives by encouraging us to fulfill our life purpose, resolve all conflicts, and develop the skills to help both others and ourselves at the time of death. 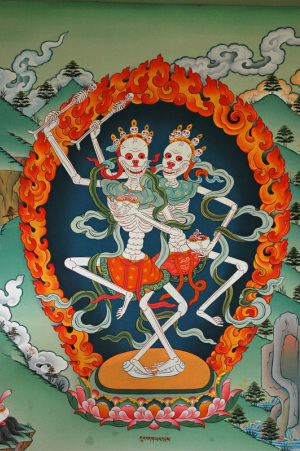 Kinkara, Citipati, The Dancing Enlightened Skeletons, Lords of the Cemetery. Photo by Wonderlane/Flickr. Here are some suggestions that may help you get the most out of the meditation practice presented here. To start with, cultivate as altruistic a motivation as possible before each session, generating the wish that your practice may prove truly beneficial for others as well as yourself. The masters who teach this meditation stress the importance of generating such a compassionate motivation before all of one's spiritual practices. And remember that you can extend the amount of time you spend on any part of the practice simply by pressing the pause button whenever appropriate. For example, sometimes you may want to spend more time on the "cleansing breath" practice (presented in track 2), or in honing your single-pointed attention (track 4). Conversely, there may be times when you wish to start with main death evolution meditation itself and skip over what comes before. Eventually, you may become so conversant with the meditation that you no longer need to rely on the CD, listening to it only when you want to refresh your memory.